Henry H. Janzen (1901-1975): pastor, teacher and college administrator; born 1 October 1901 in Münsterberg, Molotschna Mennonite Settlement, South Russia to Heinrich J. Janzen (23 November 1874 - 9 November 1945) and Gertruda (Rabsch) Janzen (b. 17 March 1878). Heinrich married Katharina Andres (11 December 1904, Mariawohl, Molotschna Mennonite Settlement, South Russia - 6 October 1991, Kitchener, Ontario, Canada) on 30 August 1923 in Mariawohl, Molotschna Colony. She was the daughter of Peter Andres (b. 1878) and Katharina (Penner) Andres (b. 1880). Henry and Katharina had eight children, with seven reaching adulthood: Rudolph, Erna, Walter, Lena, Elsa, Edward and Arthur. Henry died 4 March 1975 in Kitchener, Ontario. Henry was educated in the Molotschna settlement in Russia. He along with his wife and eldest child immigrated to Canada in 1925 and began his public ministry in 1927. Janzen's pastoral ministry included the following Mennonite Brethren (MB) congregations: Kitchener (Ontario), 1932-44; South End (Winnipeg), 1947-49; North End (Winnipeg), 1953; and Clearbrook (BC), 1962-64. 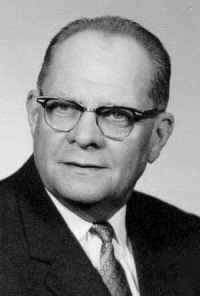 He was moderator of the Ontario Mennonite Brethren Conference, 1932-46, and was on the executive committee of the Canadian Mennonite Brethren Conference, 1946-49, 1951-52, 1963. He was the moderator of the North America Mennonite Brethren Conference, 1954-57. In addition to short-term teaching in congregations and at Bible conferences, he taught at the following institutions: Russian Bible Institute, Toronto, Ontario (1943-46); Mennonite Brethren Collegiate Institute, Winnipeg (1946-47); Mennonite Brethren Bible College, Winnipeg, where he was dean (1946-48), and president (1948-56); and in Europe, primarily at the European Mennonite Bible School at Bienenberg and St. Chrischona Bible School, both in Switzerland, 1950-51, 1957-62, 1965-66, 1969-71, 1974. In Europe, as in North America, Janzen was involved in an itinerant preaching ministry among refugees, Mennonite churches, Baptist churches, Russian-speaking people, and others under Mennonite Central Committee and the Mennonite Brethren mission agency between 1947 and 1974. He was the president of the Africa Mission Society from about 1935 to 1944. He was also involved in a radio preaching ministry in Europe and North America both in the German and Russian languages, 1959-74. Janzen was a man who was able to have influence in many differing groups. He was an articulate Bible expositor who could make himself understood widely. He had an aura about him that could appeal equally to the individual and a large audience. Therefore, he was a leader for many groups and causes. Der Römerbrief. Winnipeg: Christian Press, 1975. Und Ich Sah: eine Auslegung des Buches der Offenbarung. Darmstadt: Radiomission Quelle des Lebens, 1963. Jesu Rede über die letzte Zeit. Basel: Verlag Christliche Radiomission, Janz Team, 1959. A Brief Outline Study of the Seven Churches. Winnipeg: Christian Press, 1949, also published in German as Die heutige Weltlage in biblischer Sicht. Basel: Buchdruckerei Haupt, 1957. Von der Herrschaft des Geistes. Basel: Brunnen-Verlag, 1968. Die Mennonitische Brüdergemeinde. Neuwied/Rhein: Mennonitischen Brüdergemeinde in Europa, 1957. Wie Er uns erwählt hat. Winnipeg: Christian Press, 1962. Glaube und Heiligung: Eine schlichte Auslegung von I Petrus Kapitel 4, vers 7. Karlsruhe: Buchdruckerei Heinrich Schneider, 1951. Seventy-five Years in Minnesota: 1874-1949. Mountain Lake: Mennonite Churches in Mountain Lake, 1950. Available in full electronic text at: https://archive.org/details/seventyfiveyears00unse_0. With A. H. Unruh he wrote Der ewige Sohn Gottes. Winnipeg: Verlag-Mennonite Brethren Bible College, 1948. Janzen, H. H., Mrs. K. Janzen, and E. Ratzlaff, compiled "Lebensgeschichte." Mennonitische Rundschau, vol. 99, no. 40, (6 October 1976) to vol. 100, no. 43 (23 November 1977), 53 segments. The minutes, correspondence of the General Conference of Mennonite Brethren Churches (containing Africa Mission Society material) Box 18 A255.1-13 to A256 (material to 1937) and Box 19 A256.1 (material from NAT 1938), are held in the Centre for Mennonite Brethren Studies, Winnipeg. See also John A. Toews, History of the Mennonite Brethren Church, ed. A.J. Klassen. Fresno, CC: Mennonite Brethren Board of Literature and Publication, 1975: 172, 210-211, 277, 295, 316, 433. Friesen, Bert and Richard D. Thiessen. "Janzen, Henry H. (1901-1975)." Global Anabaptist Mennonite Encyclopedia Online. August 2006. Web. 22 Apr 2019. http://gameo.org/index.php?title=Janzen,_Henry_H._(1901-1975)&oldid=163542. Friesen, Bert and Richard D. Thiessen. (August 2006). Janzen, Henry H. (1901-1975). Global Anabaptist Mennonite Encyclopedia Online. Retrieved 22 April 2019, from http://gameo.org/index.php?title=Janzen,_Henry_H._(1901-1975)&oldid=163542. Adapted by permission of Herald Press, Harrisonburg, Virginia, from Mennonite Encyclopedia, Vol. 5, p. 463. All rights reserved. This page was last modified on 10 March 2019, at 23:22.